When a homeowner plans a decking project they are faced with a large selection of decking materials. 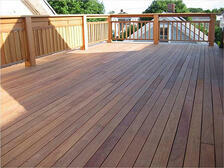 Ipe wood decking is a perennial favorite for long-lasting residential and commercial decking projects. Learn more about what makes this beautiful and practical hardwood so popular. Ipe is a species of hardwood indigenous to South and Central America, particularly Northern Brazil. Also known as "ironwood", Ipe earned its nickname because of its unique density, strength and durability. Naturally resistant to fungal decay and insect damage, Ipe is the preeminent building material for long-lasting exterior projects. Why is Ipe Wood the Ultimate Material for Decking? Ipe decking's warm tones and natural striping exemplify its unique beauty. Attractive and durable, Ipe is scratch-resistant and requires very little maintenance even in high traffic areas such as boardwalks and entryways. When compared to other wood decking species, Ipe is the superior choice for long-lasting exterior projects. What is the Appearance of Ipe Wood? Ipe has inherent color and grain variations which make its species so unique and desirable. Finished Ipe project photos best illustrate the full range of these exotic characteristics; hues will range from tan to olive brown, to browns with red hues, and some nearly black in color. Its amazing color variation is why Ipe is often called "Brazilian Walnut." What is the Expected Lifespan of Ipe Wood? When used for exterior projects, Ipe wood can be expected to last for many decades without problems. Its natural resistance to termite damage, rot and fire mean that Ipe will outperform and outlast nearly all other natural wood species. Mataverde Ipe decking is covered by a 25 year limited warranty against termites and fungal decay. Download "The Ultimate Guide to Decking"
We wish you the best of success with your decking project!